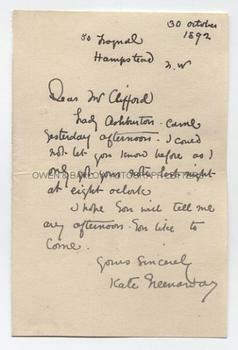 KATE GREENAWAY Autograph LETTER Signed. Catherine, known as "Kate" Greenaway was an English illustrator and author of children's books, so influential that a whole generation of Victorian mothers took to dressing their children in the Greenaway style. ALS. 1p. 50 Frognal, Hampstead, N.W. 30th October 1892. To "Dear Mr. Clifford" (probably the artist Edward Clifford). "Lady Ashburton came yesterday afternoon. I could not let you know before as I only got your note last night at eight o'clock. I hope you will tell me any afternoon you like to come." With good full signature. 12mo. Approx 6 x 4 inches. Lacking integral blank leaf. Fine. Edward Clifford (1844-1907) was an Aesthetic artist known for his watercolours. Books inscribed to him by Kate Greenaway are known. Lady Louisa Ashburton (1827-1903) was an art collector and philanthropist, known for her romantic attachment to Robert Browning and to the female sculptress, Harriet Hosmer. Eccentric and beautiful she was known as the Ludovisi Goddess and was painted by Watts.